I have a soft spot for honey. As far back as I can remember I have loved honey. Not the store bought generic variety, but local delicious pure honey. It is great in so many ways, on biscuits, in baking or in tea. In the last six months I have been using less white granulated sugar and trying to use more natural sweeteners like honey. One of my favorite foods growing up was honey and peanut butter sandwiches. The combination is delicious and my two kids love it almost as much as I do. As I have written about previously, biscuits are a big deal around here and they are made frequently for breakfast. Before giving up gluten I made them at least a couple of times a month. Biscuits are very versatile and can be great with breakfast or dinner. Last month I made a recipe for Buttermilk-Cornmeal Drop Biscuits with Honey Butter from the December issue of Everyday Food magazine, which looked quick and very simple. This recipe has 8 ingredients. It takes 30 minutes of total time, 15 minutes of which is active and makes 10 servings. All of the ingredients are basic and I had no problems finding any of them at my local grocery store, so I made no modifications. I did use organic butter and buttermilk. I try to buy organic for chicken and dairy. The dough will be very sticky, do not overwork it or the biscuits will end up tough and will not rise properly. Make sure to use parchment paper to bake the biscuits. It really does work better for baking, I highly recommend it. I followed the remainder of the recipe as written. I made these biscuits before I gave up gluten. One of the things that I miss the most about not eating wheat is easy biscuits. This recipe is very easy to make and the honey butter is delicious. The honey butter could easily be used on other things such as sweet potatoes, bread or other baked goods. I could see the butter being absolutely yummy on cornbread. I made a great gluten free cornbread recipe last week that would work with the honey butter. Overall, this is a very easy biscuit recipe that takes little time to make and was very popular in my household. 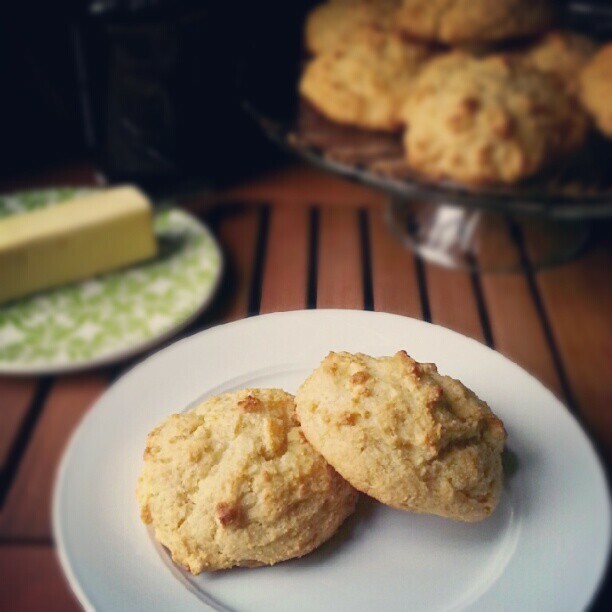 For the recipe go to Buttermilk-Cornmeal Drop Biscuits with Honey Butter. Thanks :) They were very yummy and incredibly easy! Thanks :) Going over to link up now, thanks for hosting! I hope you like the recipe if you end up trying it :) It really is easy and delicious! it's 12:51, and I'm hungry, and I probably shouldn't be looking at your recipies right now...but wow, does this look good. I seem to always be hungry :) These really are good I promise!